In attending the conference Painting beyond Itself in 2013, held in Cambridge, MA, my face was one of many, in an auditorium grain smudge, a morsel. It was a wonderful experience. 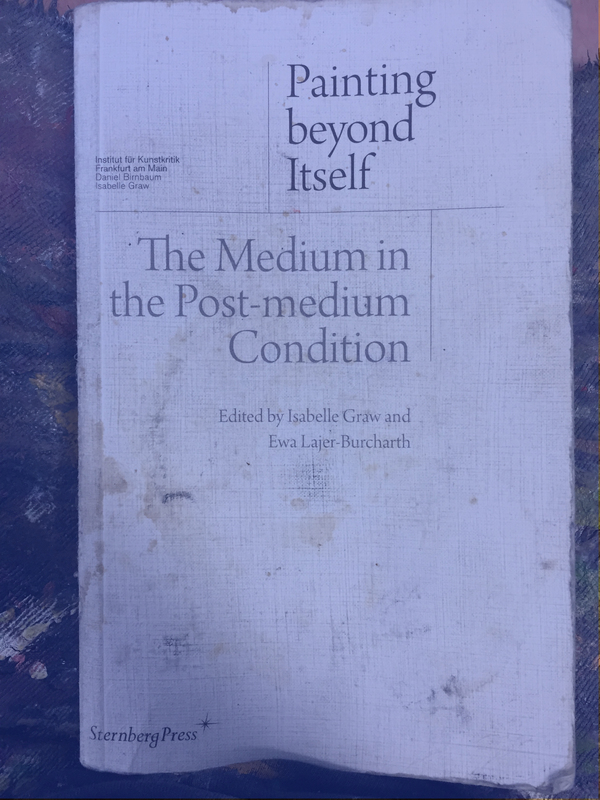 The document, Painting beyond Itself: Medium in the Post Medium Condition made by the organizers and published by Sternberg Press, in 2016, revisits and revises the previously presented material. I love books and was excited to read this one. Most of the texts in the book Painting beyond Itself attempt to make sense of substance (material) or present research for intrigue. In a way, this is what my edited notes attempt to do as well. The original authors are no slouches. Carol Armstrong, Benjamin H. D. Buchloh, Sabeth Buchman, Réne Démoris, Isabelle Graw, David Joselit, Jutta Koether, Ewa Lajer-Burcharth, Jacqueline Lichtenstein, Julie Mehretu, Matt Saunders, and Amy Sillman are each truly exceptional (scholars, artists, philosophers) experts who have spent years of labor to get to their current intellectual, social and economic heights. Their texts are the result of this labor. Then, I come along and chop up their ideas, effort, and time invested. They may not appreciate the edit. And, well, I’m not an editor. What is the result of the reduction, these fragments? Poetry. Except, I’m not a poet. Maybe a good read is as a summary, like Cliff Notes for Art Theory. Still, in Cliff Notes, the information must be clear and accurate, which isn’t always the case in these edits. I REALLY JUST WANT THE WORDS TO BE A JOYOUS CURIOSITY TO READ, AND POTENTIALLY PROVIDE INSPIRATION, criticism, and discourse. Reading is a consistent pastime. When I read theory I underline. The noted underlines are now gathered together to create new texts and different interpretations. This is not a writing project and, yet, it is. These are not my words, but rather words jumping out at me: a screening, or gateway through, backward, around, over. the nature of darkness stands between the diminution (dimming) light. color, the decomposition of light. Toroni Buren transgress boundaries like an agent. don’t, collapse the index object pair. lead, copper, aluminum, oxide, arsenic, cobalt. naphtha, or benzene. freedom, innocence, gay politics, civil rights. Childhood innocence can subvert capitalism. Mark Dilks, born in Philadelphia, lives and works there. Mark’s works move through paint, object, text and sound. Screens and Screening have been a research focus. Professors and Peers at Hampshire College, Pennsylvania Academy of the Fine Arts, and Maryland Institute College of Art informed his work and research. University of Pennsylvania gave him an Interdisciplinary Arts MFA in 2013. Grateful thanks to youse.